Constructive calculator could help You to calculate allotment of materials for housebuilding or maintenance. Gives You opportunity to check your contractor for overspend and momently provide you necessary information. This app perfectly works without connection to Internet and provide an exhaustive information by the targeted calculation. 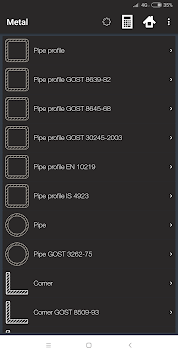 Constructive calculator is unexpendable assistant at materials calculations and budgeting by the targeted housebuilding task. Also You may send me Your requests and offers about improvements and new calculations. I'll try to consider them in regular updatings. 1. Concrete value for foundation plate calculation. Calculate concrete volume and load area by foundation. And also its cost. 2. 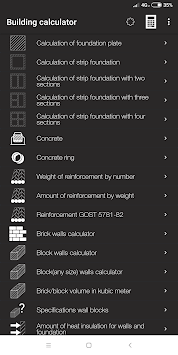 Concrete value for strip foundation calculation. Calculate concrete volume and load area for foundation. And also concretes cost. 3. 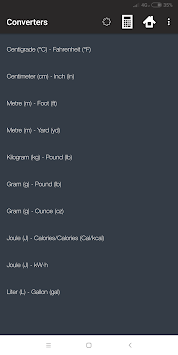 Armatures weight by its quantity calculation. 4. Armatures quantity by its weight calculation. 5. Brick quantity for brick walls calculation. Calculate amount of bricks for building different size walls, number of brick lanes upright and load for foundation. Estimate rough cost of materials! 6. Block quantity for brick walls calculation. Calculate amount of gas-concrete, foam-concrete or onother block for building different size walls. Estimate rough cost of materials! 6.1 Wall blocks of prescribed size calculation. If You intrested in paint amount required for fill walls, and also it raw cost, This calc would help Your! Use the convrtors to transform units of measurement! In the nearest time new calculations will be add to app. Added capacity calculations and fix some bugs.